sea; in the top kilometer *Thermal energy is absorbed on Earth. It's easy to guess that more is absorbed by the larger oceans, and that it takes time for the heat to penetrate to the bottom. The suprise is the 90% figure, but you aren't asked about that. Easy question! near the poles * Why do the poles heat up more? See nasa.gov suggests the main reason is that snow is white and tends to reflect the sun's energy. As the snowline retreats up north, more energy is absorbed. Also, perhaps, the increase in storms is circulating the air more, making the Earth's temperature more uniform. Which statement is FALSE about the lede's map of the temperature anomaly (2000-2009)? the world economy *Easy to guess this one: The world economy determines how much energy we use. Wealth and energy consumption are strongly corrolated among the nation. 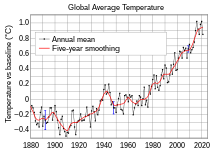 The Earth's average surface temperature rose by approximately _______ per decade over the period 1906–2005. The urban heat island effect refers to the fact that urban areas tend to be hotter than rural areas. The urban heat island effect is estimated to account for approximately _____ of the temperature rise over the past century. 3% * Just remember that it is a small effect, but not extremely small. This effect involves the fact that more measurements are now made in cities than in the countryside. Proxy temperatures measurements are defined as measurements made using measurements from space. a tiny gap at the end of the proxy measurements * wikt:Ad nauseam or wikt:Ad nauseam (without italics? You use italics whenever you want to emphasize that this is a Latin phrase or if people are not likely to know what it means. What happens when water is heated? it expands at temperatures above 3.98°C and contracts below 3.98°C * This is logical: Water shrinks when cooled, but expands when it freezes to ice. There must be a transition somewhere! false * I forget why this is true, perhaps it is because we can measure the ocean temperatures? Ocean temperatures are increasing more slowly than land temperatures because oceans have more heat capacity and because evaporation cools the water. The "Greenhouse effect schematic" in the section on "Temperature changes..." indicates that most of the energy from the Sun is absorbed by the earth's atmosphere. The "Greenhouse effect schematic" in the section on "Temperature changes..." indicates that most of the energy from the Sun is absorbed at the earth's surface. Which external force plays the smallest role in current efforts to model global warming? "External forcings" refer to effects that can increase, but not decrease, the Earth's temperature. false * See w:Climate_change#External_forcing_mechanisms and Climate_change#Internal_forcing_mechanisms. The latter refers to (1)Ocean/Atomosphere variability and (2) Life. Everything else is external. This is a stupid definition that you should forget after taking this class IMHO. "External forcings" refer to effects that can either increase or decrease, the Earth's temperature. false *** I will delete this from the quiz (you all get it right). This might be a typo. In class (if you ask) I will remind you that forcings can either increase or decrease the temperature. Water vapor contributes more to the greenhouse effect than does carbon dioxide. Carbon dioxide contributes more to the greenhouse effect than does water vapor. false * Surprise to the non-expert (that scientists have been aware of for years). See "feedback" in later portions of this exam. Note how I put the true/false question in in both directions. show a steady rise in CO2 levels, at constant slope, and irregular fluctuations due associated with El Ninos and La Ninas. The climate change community is divided between those who believe the goal should be to eliminate the earth's greenhouse effect altogether, and those who argue that we should attempt to minimize earth's greenhouse effect. It is expected that carbon emissions will begin to diminish in the 21st century as fossil fuel reserves begin to dwindle. is a proposal to trade carbon credits. is an effort to store carbon in underground caves. Soot tends to warm the earth when it accumulates in atmospheric brown clouds. Soot tends to cool the earth when it accumulates in atmospheric brown clouds. In the arctic, soot tends to cool the earth. In the arctic, soot tends to warm the earth. Approximately what percent of global warming can be attributed to a long-term trend (since 1978) in the sun's energy? 0% *The energy output from the Sun fluctuates slightly but can be completely ruled out because the fluctations are cyclical and the correlations are easy to measure. A rare case where the "extreme" (zero) answer is correct. Depleting the ozone layer cools the stratosphere because ozone allows UV radiation to penetrate. Depleting the ozone layer cools the stratosphere because ozone absorbs UV energy from the sun that heats the stratosphere. true * TYPO will be deleted from test: should have been "warms" instead of "cools"
how much the Earth's surface absorbs or reflects incoming sunlight *Latin root: albus means white as in albino (person with no skin color) and albedo (astronomy) and albumen (egg white). true *:See figure: It will show that an OVER-SIMPLISTIC model allows one to calculate the temperature of any planet if the greenhouse effect is ignored. false *:See figure: The Sun is in the center and emits visible light (shown as yellow). The red planets are equadistant from the Sun and emit IR (infra-red) light (shown as red). Stefan-Boltzmann radiation is called a negative feedback mechanism because if the sun's radiation increases, the Stefan-Boltzmann law ensures that more heat is lost from the planet to compensate. true *:See figure: The dotted lines describe cones of energy coming from the Sun. The big planet gets four times the energy from the Sun, but emits 4 times the IR (at the same temperature) because it has twice the radius as the smaller planet. Stefan-Boltzmann radiation is called a negative feedback mechanism because if the sun's radiation increases, the Stefan-Boltzmann law ensures that this heat is retained by the planet. false *:See figure. Stefan-Boltzmann radiation balance law is not a feedback effect. Computer models accurately model feedback mechanisms associated with the role of clouds as a feedback mechanism. false *:Clouds are really hard to model ... it's the "weather"! Computer models accurately model feedback mechanisms associated with how the soil will retain or release CO2 as the earth warms. Analysis of the uncertainties associated with feedback suggests that the "worst-case" scenario is easier to model. false * Worst case scenarios are the most difficult to model: What are the chances that A and B occur, but that the hoped for B does not? Analysis of the uncertainties associated with feedback suggests that the "worst-case" scenario is more difficult to model. true * Worst case scenarios are the most difficult to model: What are the chances that A and B occur, but that the hoped for B does not? While computer modeling indicate that the warming since 1970 is dominated by man-made greenhouse gas emissions, they are unable to conclusively ascertain whether the warming from 1910 to 1945 was anthropogenic. Computer modeling has conclusively established that anthropogenic warming has occurred since 1910. How is the validity of a computer model typically tested? by verifying its ability to calculate past climate conditions. by verifying its ability to calculate current climate conditions. by making predictions about future years and seeing if they come true. Four quzzes are based on the Wikipedia article Global warming (permalink). Instructors can print out pdf versions of these quizzes that are randomized for classroom use at Quizbank/How_things_work#Global_warming. This page was last edited on 8 November 2017, at 17:26.